1. Dig the planting hole. 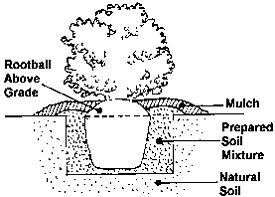 The hole should be dug at a depth so that 1/8 to ½ of the rootball will sit above the ground. Planting trees and shrubs too deep is a major cause of plant death. The hole should be 12" wider than the rootball for shrubs. 2. If the soil is slightly sandy or light you will not need to add additional amendments but if it is too sandy water will run right through therefore unable to sustain the needs of the newly plant shrub. Plant the same way as you do as if planting in clay. If the soil is heavy (clay) then add top soil or compost for every three to four shovelfuls of dirt removed from the hole. Mix thoroughly. 3. Remove the plant carefully from its pot by laying it on its side and lightly tapping the sides of the container. Gently slide the plant out of the pot sideways. Always handle the plant by its rootball. If the potting mix becomes loose from the rootball do not worry, just mix with the existing soil and put a little soil to the hole to keep the plant for settling too deep. 4. Place the plant into the hole. Make sure the plant is standing straight. Fill the hole with the soil mixture. Pack down the soil as the hole is being filled. Do not put soil on top of the rootball. 5. Mulch around the base of the plant. The mulch should be 2-3" deep, but no more than 3". Do not pile mulch around the trunk (like a teepee or volcano). 6. Water the plant thoroughly after planting. When weather becomes dry give the plant a good soaking at least twice a week. 7. Use a small amount of low nitrogen fertilizer such as Azalea and Rhododendron food or a general purpose fertilizer for lawn and garden after planting. 8. When planting a tree follow the same instructions as planting a shrub. 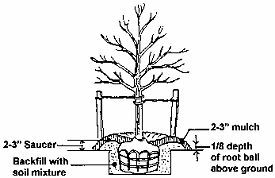 It is important to stake the tree to insure stability until it is established in the landscape (see the second image by clicking NEXT at the top). Once the tree is established remove the stake and material used to hold it upright. Staking is especially useful in windy areas.